Earth geometry is a special case of spherical geometry. When we measure distances that a boat or aircraft travels between any 2 places on the Earth, we do not use straight line distances, since we need to go around the curve of the Earth from one place to another. To understand the geometry of earth, we need to learn the basics of spherical geometry. Straight lines are great circles; so any two lines meet in two points. A geographic example of a great circle is the equator. The meridians of longitude form exactly half a great circle. The parallels of latitude are small circles, except for the equator. If A and B are two points on the sphere, then the distance between them is the distance along the great circle (green) connecting them. where R is the radius of the sphere. A central angle is an angle whose vertex is the center of a circle, and whose sides pass through a pair of points on the circle, thereby subtending an arc between those two points whose angle is (by definition) equal to the central angle itself. 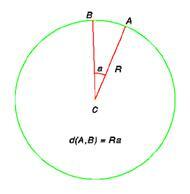 It is also known as the arc segment's angular distance. Since the Earth is very close to a sphere (ball) shape, with an average radius of 6371 km, we can use our knowledge about spherical geometry to solve problems regarding the geometry of the Earth. Geodetic distance is the length of the shortest curve between those two points along the surface of the earth model being used by the spatial reference system. Geodetic distance behaves well for wide areas of coverage, and takes the earth's curvature into account. It is especially handy for air and sea navigation, although care should be taken to distinguish between rhumb line (curves of constant geodetic bearing) and geodesic curve distance. The simplest way to calculate geodesic distance is to find the angle between the two points, and multiply this by the circumference of the earth. 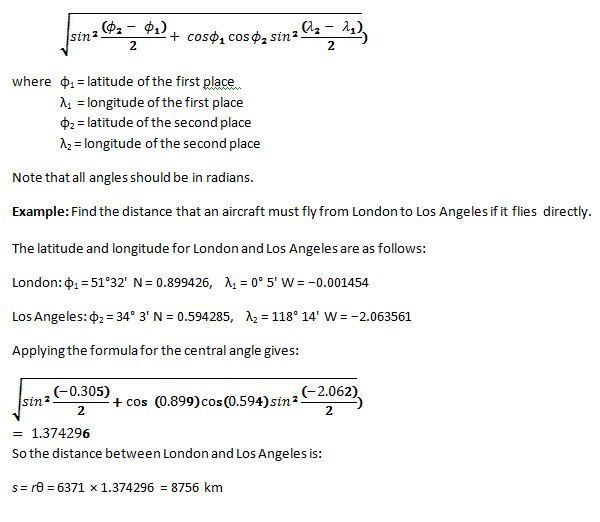 However, a more accurate solution is provided by the formula for finding the central angle using half angles. Which of the following is the distance between Boston,Massachusetts and Brussels, Belgium? How far is Copenhagen, Denmark from Carlsbad, New Mexico? 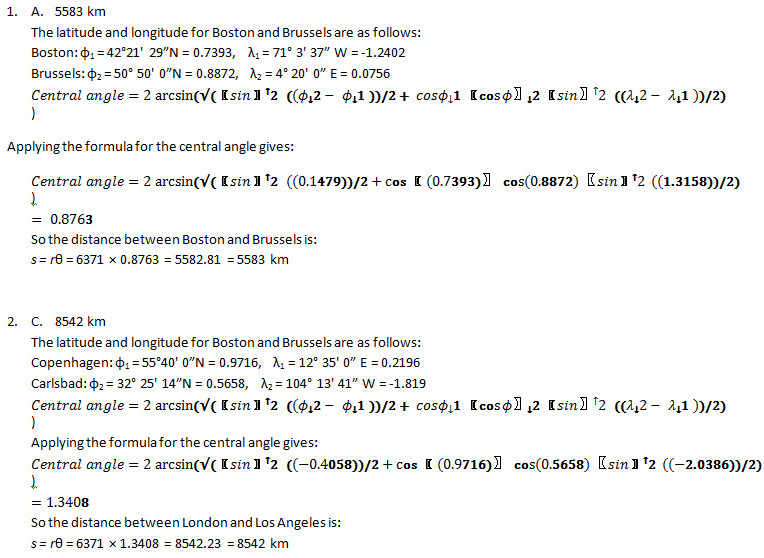 From Question 1 and 2, we can say that the Boston and Brussels are farther apart than Copenhagen and Carlsbad, NM. Answer: False. Obviously, the distance between Copenhagen and Carlsbad is farther apart than Boston and Brussels. 3. False. Obviously, the great circle between Copenhagen and Carlsbad, NM is greater than that of Boston and Brussels. Suppose you live in Northern California, which among these cities is the farthest from San Francisco? Consequently, which among these cities is the nearest from San Francisco? Which of the following cities are the farthest apart? What is the great circle between Mecca and Moscow?